Offering select Half-Arabian and Purebred Arabians that by size qualify as "Ponies" for Open competitions. Shanaia is a 1998, 13.3 hand chestnut filly with a flaxen mane and tail that will be an attention-getter wherever she goes. She is very refined, correct, classy, and extremely friendly. 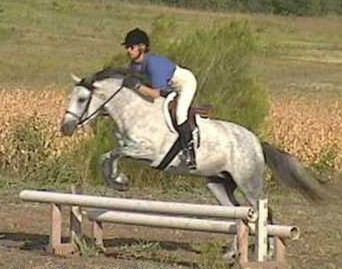 She has been ridden on trails and started over fences. While she is straight Egyptian-Arabian so she could compete in the Arabian world, she is so quiet she will do well in any pony circuit. Email for pictures. Ridden by a small adult and intermediate teen. E-mail for further information. 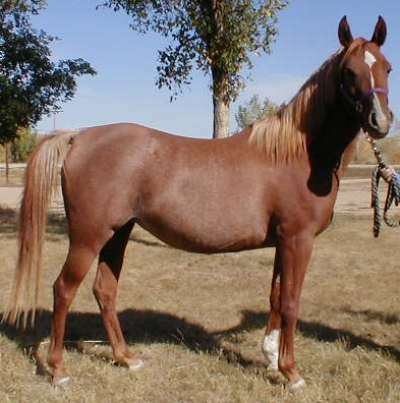 Jewel is a 1998 13.3 hh chestnut with beautiful markings. The name says it all! 1/2 Egyptian Arabien with a dam whose pedigree contains many of the greats such as: Ferzon, Fadjur, Nabiel, Ferneyn & Sakr. She has a most exquisite head, long neck and excellent body. Her action is exciting to watch with a wonderful floating trot. She is very friendly and has been started over fences. Trained ponies suitable for children or small adults, beginner to advanced, and prospects ready to start training are available. Excellent for children and small adults for Dressage and Hunter. Excellent for starting children in walk-trot and leadline. Some breed specific crosses available that are eligible for competition in other breed divisions--i.e. in addition to Arabian/Half-Arabian--and for producing Half-Arabian ponies. NOTE: Information on sizes is provided by the owners. Other information provided by the owners or based on documentation provided by them.